Gold Mountain’s full service Golf Shop is the place to check out a wide variety of demo clubs, woods, irons, hybrids, and wedges. Not only can you demo clubs on the range, but you can play all 18 holes with them to make sure they’re the best clubs to enhance your game! We carry a wide variety of the top brands – Callaway, TaylorMade, AdamsGolf, Cobra, Cleveland, Titleist, Wilson, Ping, Nike, Mizuno, and more. 30-day guarantee – if they aren’t the perfect clubs for you, we’ll find the correct fit that is! And we’ll price match any other authorized retailers in the state! Complete sets start at $249.99 for the beginner including bag, woods, hybrids, irons, putter and headcovers. 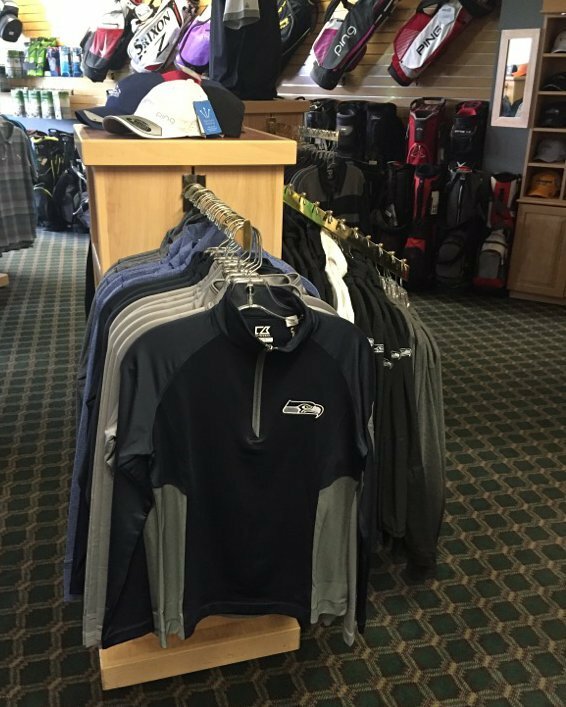 It’s not just about the clubs – we carry favorite golf apparel lines such as Nike, Adidas, Puma, Greg Norman, Cutter & Buck, Antigua, GG Blue and Nivo as well as a large shoe inventory featuring Nike, Adidas, Puma and Sketchers. Visit our online store to purchase gift cards – perfect for golf, dining at The Restaurant, or shopping in The Golf Shop.